Some people have asked us, since Yunohana has removed the "Japanese Only" sign, why are you doggedly pursuing this case? The fact is that the sign was not removed, but was craftily replaced with a new sign. This was done only after reading about our intention to sue in Hokkaido Shinbun on January 16, 2001. After sixteen months of negotiations, from September 19, 1999 onwards with absolutely no compromises, they magically came up with this "solution" in less than 24 hours. However, we argue that this is no solution. The new sign, printed only in Japanese, specifies conditions under which Yunohana will allow foreigners to enter and bathe. These four conditions, applied only to foreign-appearing people, are totally unacceptable to us. 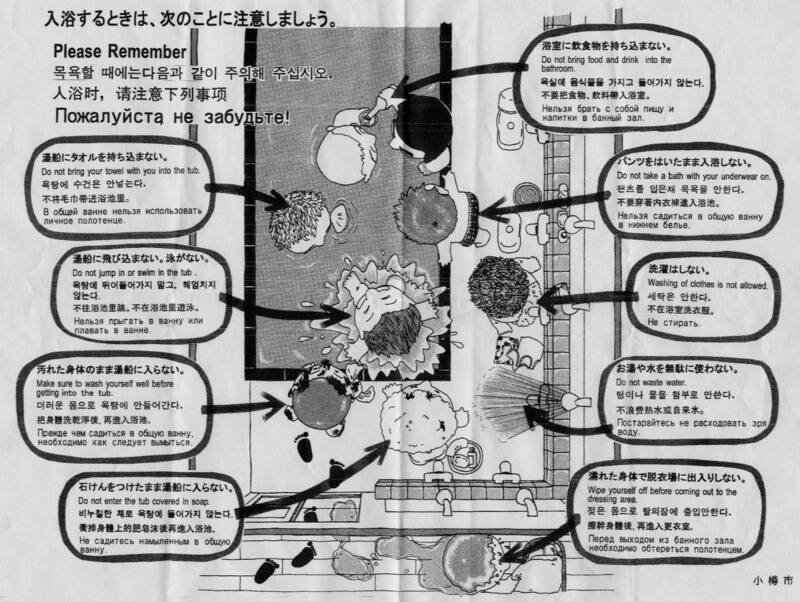 These may seem at first glance to be fairly reasonable requests for Yunohana to make, given the circumstances, in order to avoid misunderstandings amongst Japanese and Foreign customers. However, even a little consideration will reveal these conditions to be completely unfair. "Those who have lived in Japan continuously for more than one year"
The only way to prove that we have lived in Japan continuously for more that one year is to show Yunohana our Gaikokujin Touroku Shoumeishou (Gaijin Card). A driver's license or passport does not provide this information. This ID card, carried by all foreign residents in Japan, contains amongst other things, our name, current address, date entered Japan, and passport number. Do we want to share this information with Yunohana? Do we know how they will use this information? Or who they will share it with? Will we begin receiving unwelcome correspondence and communications after visiting Yunohana? Demanding a Gaijin Card is not something lightly done. Under the Foreign Registry Law (Gaitouhou), nobody but those empowered by the Ministry of Justice (police, Customs officials, Coast Guard) have the right to even ask for it (and yes, that means the JR platform police were bluffing when asking for your ID--they are not legally enpowered to do so). Even Japanese police are restricted in their ability to demand proof of ID from foreigners (and are forbidden from asking citizens) who are not suspected of a crime (see Debito's article on this here). Foreigners are also required to show their Gaijin Card when getting, say, a house loan. This requirement is somewhat understandable. Yunohana's is not. Upon presenting proof of residence, foreigners (that is, foreigners only) are also required to sign a registry to become a "member", giving an address and phone number. Who sees this information? Why don't Japanese-looking people have to become members? Because it would inconvenience them. Just as it inconveniences people who look like us. "Those who sufficiently understand bathing customs"
This assumes that foreign-appearing people either do not understand Japanese bathing customs or cannot learn. Why can't Yunohana simply post bathing customs in Japanese, English, Russian, Korean and Chinese like others bath houses in Otaru (and for that matter, all over Japan--there is even a standardized rule poster in eight languages freely available from the National Public Baths Public Health Association, or Zenkoku Koushuu Yokujou Kankyou Eisei Dougyou Kumiai Rengoukai)? An even cheaper solution is to simply hand out a hand-bill to everyone who enters. (See JPEG image of bathing customs flyer already provided by the City of Otaru, which the discriminatory bathhouses refused to distribute) Those who feel they sufficiently understand bathing customs may then return the flyer immediately, incurring minimal cost to the premises. While a basic understanding of spoken Japanese may seem quite reasonable, what about children. Okay, so they have their parents with them. But then what about deaf people? As my wife works in this field, I know from personal experience that foreigners with severe hearing impairments have great difficulty communicating in Japanese, let alone even their own language, aside from sign language. What about the mentally impaired or the dyslexic? And is Yuransen qualified to "judge" a person's language level as worthy of the rubric "undertanding". Sounds like the literary tests administered to African-Americans at polling booths in the American South a century ago. Yunohana seems to have been is such a rush to make up this rule that they have not carefully considered all its implications. i.e. those who do not smell funny"
Assuming that foreign-appearing people smell is a blatant racial slur. If this were America (or for that matter any other OECD country with anti-racial discrimination laws--they all do, except Japan) and a White business demanded "No Black people with flies buzzing about them", what would happen? And what do people go to a bath house for anyway, if not to wash away their body odor? It's like posting a sign on a laundromat - "No Dirty Clothes"
In short, any "rules" or "conditions" for entry to any business that are applied solely on the basis of race is absolutely unacceptable to us. Even if we were to win our case in court, but this sort of racial harassment were allowed to continue, then it would be a hollow victory indeed.